In 2018, "WAT"—an association for Women in Architecture, Taiwan—is organized and legally formed under the permission of the Ministry of Interior. For women in architecture in Taiwan, this step is not easy. As a matter of fact, it took 18 years of brewing and over 70 years of sowing before it blooms into reality. Take a good look of the history of architecture in Taiwan which man seems to dominate, you'll find that SHE is always there and persists on her work. But not until this moment did she show up, as if Athena of Architecture comes to life. To fill in the gaps inside history. Promote the recording and research of the history of female pioneers. Ultimately, composing a historical spectrum with a broader, macroscopic and inclusive scope. To voice female professionals' concern for public issues. With their wisdom and unique perspective, women in architecture will inspire people to transform ideals and passion into actions in social participation. In today's Taiwan, women in the allied fields of architecture are no longer minority. Inside educational institution, the number of female students is about the same as male students; in spatial design-related professions, the number of female also has a significant increase. Out of an acute awareness of gender differences, more attention paid to architecture as a public issue, and pursuit for equal work right and working diversity, female professionals come to form a consensus and organize to establish WAT. With WAT, we hope to surpass the long-term limitation of a professional organization which defined qualification by the presentation of an architect license. We hope to fill in the gap of "Herstory" in the allied field of architecture, and to redefine "women in architecture". Therefore, our membership welcomes outstanding female applicants who are: teachers and scholars in academia; female practice architects, designers, and engineers in construction engineering; female professionals in interior design, landscape architecture, and urban design. With WAT, we hope to promote the recording and research of women in the architectural history in Taiwan. The world of architecture once denied access to female professionals, so is in Taiwan. While the first architecture school at college level in Taiwan, Taiwan Provincial College of Engineering (台灣省立工學院), now National Cheng Kung University (國立成功大學) was established in 1944, it was not until 1948 that the Department of Architecture was opened to female students. Later in 1953, Hsiu-lian Wang (王秀蓮, 1929-), passed the first year of national architect examination and becomes Tainan’s first female registered architect. For a long time, despite the remarkable performances of female architects, the studies of Taiwan’s architectural history fail to provide a clear and thorough record of their contribution on architectural design and education. The effort of forming an organization for women in architecture can be dated to last century. In 1983-84, a seminar on female architects took place and was reported by Taiwan Architect Magazine. 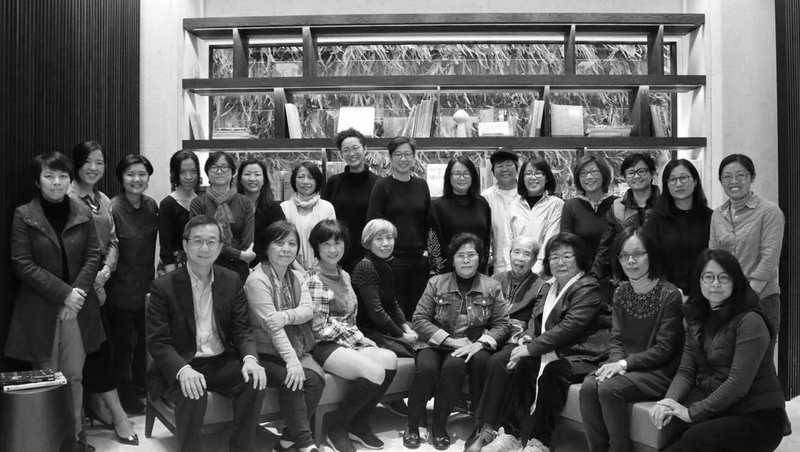 In 2000, Architect Tes-Nan Hsiu (修澤蘭) and Chiu-Hwa Wang (王秋華) called for a meeting for “a propose to the founding of Sorority for Female Architects in R.O.C.” Unfortunately, the organization did not form until 18 years later. Valuable data failed to be preserved in time. Women in architecture have not received the recognition they deserve in architectural history. The title of “Women in Architecture” as the name of association can be dated to 1922. Female architect Harriet Mae Steinmesch founded “Association for Women in Architecture (AWA)”. Its mission is to build a mutual support network between women in terms of architectural education, pragmatic work, learning and working. The fact that women around the world were once denied accesses from architectural education motivates its establishment. It was after 1915 that departments of architecture and practical works gradually open its gate to women. During 1970s-1980s, AWA gradually spreads out to set up branches in major cities in USA. AWA persists in pursuing the reform of architectural education and institution, and in demanding that women’s needs for learning resources has to be satisfied while their accomplishments to be recognized. At the meanwhile, as branches started rooting by promoting localized professional services according to local communities’ needs, some AWAs inside college campus made intellectual contribution by utilizing their research ability and access to resources. Archives of female architects are built, profiles and documents are carefully preserved so to promote relevant researches—Association for Women in Architecture Record and Yale Women in Architecture for instance. In recent years, the UN Women spares ever effort on promoting gender equality and the empowerment of women. With a special focus on the necessary revolution of professions with long-existing gender issues, the UN Women hopes to promote sustainable development of mankind. Despite the raised consciousness of gender equality in every aspect, female professional in the allied fields of architecture still facing restrictions imposed by the professional institutions. The unfavorable situation hinders their talents to come into full play. Nowadays, organizations all over the world such as AWA, WiA and NAWIC, endeavor on fighting for the equal work right of women in the allied fields of architecture. Female professional’s salary, treatment, and leading position have come into the spotlight, their accomplishment and contribution asked to be seen and recognized. Today, with more and more attention to the public space issues, these organizations’ power of influence have spread out across the globe. In Taiwan, the founding of WAT is just an expected beginning. The founding of WAT begins with a great lost. In late 2016, Architect Le-Ching Chiang (姜樂靜) wrote a Facebook post which mourned the death of the first practice female architect in Taiwan, Architect Tes-Nan Hsiu (修澤蘭, 1925-2016). Unaware of, even indifferent to the lost of Hsiu as a remarkable role model, architects in Taiwan paid no tribute to her death and contributions. This upsets Chiang. In response to her comments, two journals of architecture in Taiwan stepped forward. Taiwan Architecture (TA, 台灣建築雜誌) and Architectural Institute of Taiwan Magazine (臺灣建築學會會刊) respectively published a special issue on Hsiu in February and April, 2017. Meanwhile, Yu-Chih Hsiao (蕭有志), the head of Dept. of Architecture at Shih Chien University (實踐大學), created a Facebook group named “Architect Tes-Nan Hsiu’s Researchers Club” (修澤蘭建築研究同好會). This group is used to openly invite further discussions and initiate the collecting of historical materials for Hsiu’s case studies. 27th of Feb., 2017, the idea of forming WAT was formally brought up. To commemorate the first death anniversary of Hsiu, a group of architects arranged a special tour which centers on her works. After revisiting Yang Ming Senior High (臺北市立陽明高中) and Chung-Shan Building (中山樓) at Taipei City, they watched a documentary on Hsiu’s life at Li-Yu Hsu (許麗玉)'s studio. With accumulated feeling at the moment, Le-Ching Chiang took the chance to bring up Hsiu’s uncompleted mission of organizing “the Sorority for Female Architects in R.O.C.” back in 2000. She pleaded Moon-Lin Jao (趙夢琳), Secretary General of Architectural Institute of Taiwan, to assist this proposition. It should be noted that Architect Li-Yu Hsu, the guest editor in chief to the special coverage on Hsiu for Architectural Institute of Taiwan Magazine, made an arrangement that almost all authors to that issue are female (except one male photographer and one male graduate student who studied licensed prostitution in Taiwan). At the meanwhile, as a subsequent effort to forming a society for female architects, Li-Yu Hsu planned a walking tour on Hsiu’s another representing architecture case: Taiwan’s first ever large-scale unit development and the first suburban community, “New Garden Village” (花園新城) at Xindian, New Taipei City. The tour was named “Walk with Hsiu—Revisiting Architect Tes-Nan Hsiu’s New Garden Village.”On 21st Mar., 2017, a Facebook page “WOMEN in Architecture Taiwan” (later as the Facebook page for WAT) was created to record the tour. It was the debut of WAT in social media platforms. Si-Min Lee (李思敏), the graduate student who was composing her Master thesis at the Graduate Institute of Architecture, NCTU, helped carry out the event. The tour was not planned not just an ordinary sight-seeing one. It was also an academic project which produced fruitful researches on Hsiu. As a result, to organizer’s surprise, the tour attracted many people’s attention. Related production of the tour includes a prior interview with another female architect, Chiu-Hwa Wang(王秋華, 1925-); a documentary narrated by Hsiu’s son, De-Hsiu Fu (傅德修); and a preliminary collection of architectural cartographic data . 15th Apr., 2017, the walking tour was held successfully. At the end of the day, a hundred people took an unforgettable tour in the 50-years-old community residences which famed for its residence (which are mostly high rank officials and famed artists) and its wonderful accommodation of buildings in natural scenery. After the tour, a discussion on “Why do we have to establish WAT at the moment?” took place on the 1st dinner table meeting. The 2nd dinner table meeting was held in 4th June at the same year, inside Huashan 1914 Creative Park. The consensus on establishing WAT was gradually formed and a pattern of teamwork, with a bi-monthly meeting, appeared. Li-Yu Hsu proposed that members should observe and think about if the formal registration process of WAT is necessary within 6 months. In September 2nd, 2017, WAT co-sponsored a new project as an effort to promote and preserve “Her-story”, the first core mission of WAT. The project, “Architectural Criticism Open: Architect Chiu-Hwa Wang and CYCU Library as a Beginning” (堂二建築評論：王秋華建築師與中原圖書館) is bigger in scope compared with the “Walk with Hsiu” tour. This activity urges the forming of Dio-Xi Research (著時研究所), a group of young generation who are interested in contemplating the meaning of architecture in our time. The first case for study was CYCU Library (中原大學圖書館), the first modern library with open-shelf design in Taiwan. Her designer is Chiu-Hwa Wang, an excellent female architect. As a result, the co-sponsoring set out a continual effort of fulfilling our first mission: Her Story. The success of this event can be contributed to Chiu-Hwa Wang (aged 92 years then)’s full support and open-minded sharing. This event was reported by Taiwan Architect Magazine (建築師雜誌) issued on January 2018 with a special cover. Dio-Xi even filmed a documentary for foundation of further discussion. On Oct. 7th, 2017, WAT members hold our 4th discussion at Wistaria Tea House (紫藤廬). More women in architecture attended the meeting and shared their stories. Consensuses are forming. Late October, 2017, a breaking news upsets architects in Taiwan. DPP Legislator Ding-Yu Wang proposed to amend Article 193 of the Criminal Code, demanding that architects should face long-term imprisonment even death penalty if they commit “manslaughter due to occupational negligence” (業務過失致死罪). The public attention which attracted by founding members’ opinions, reminds these female architects the power of making voices. Thus, “Her Voice” became the second critical mission for WAT. As WAT made its own debut on mass media press, it paved the next step for the official organizing of WAT. Later, these 6 architects volunteered to be the preparatory committee on the way of founding WAT. Li-Yu Hsu set out to prepare the application forms and draft constitution articles of WAT, while others respectively went searching for other founding members. On 16th Dec., 2017, the 5th dinner table discussion took place at a local social enterprise, Small Farmer’s Shop (小農舖子) at Yilan County, which is downstairs ofarchitect Ya-Chi Ching (景雅琦)’s studio. Li-Yu Hsu introduced the idea of forming WAT to all the participants, including: Chia-Chi Chao (趙家琪), the architect who assist Tes-Nan Hsiu on the attempted founding of “Sorority for Female Architects in R.O.C.” back in 2000; Moon-Lin Jau, the Secretary General to Architectural Institute of Taiwan; and Chung-Twan Kuo (郭中端), a well-known landscape designer who was commenced by a female architect award by Japanese Academia. Among them, Chung-Twan Kuo (郭中端) reminded WAT of its very beginning. The mindset of establishing WAT should be as inclusive as possible, like “all rivers run into sea.” Kuo also suggested that WAT should spare effort on the preservation of craftsmanship skills, and pay attention to make sure that architecture, arts, environment, along with humanity, will altogether develop with always a good intention. “Her Persistence,” therefore, becomes the third core mission for WAT. On Feb. 1st, 2018, an official application document of WAT was delivered by Li-Yu Hsu in person to the Ministry of Interior (MOI). On Mar. 15th, WAT received permission for organizing a social group from MOI (台內團字第1071400500號). The preparatory committee of 11 members officially started working. Finally, on May 5th, WAT called forth the inauguration meeting and the first members’ congress. WAT hold the election of Board members for the first time. On August 22nd, WAT completed the official registration as a national and regional people’s association and received a formal permission document from MOI (台內團字第1070054055號).